Reproduction of a pistol, made in metal with lacquered wooden grips, with simulating mechanism of loading and firing. Within the wide range of short weapons, the C-96 has the honor of bearing the name "classic", also known as "Broomhandle". 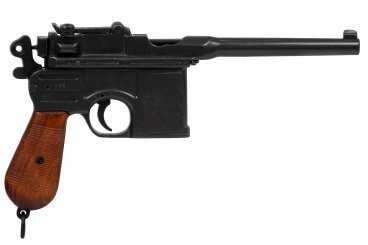 It was a semiautomatic pistol produced in Germany from 1896 to 1937, created by the great Peter Paul Mauser. This semiautomatic pistol, with more than a century of history, has an extremely functional and practical design that has become to be recognized as one of the best weapons in the world. This pistol is very good. I have it and it is perfect. You are avery good company. Thank you!